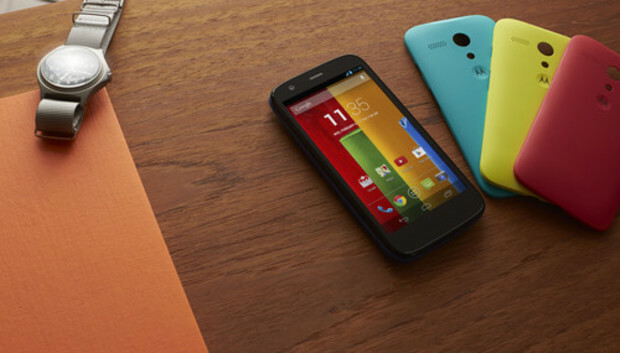 Following a leaky build-up, Motorola introduced the 4.5-inch Moto G, a smaller budget version its flagship Moto X. The Moto G, which will be available around the world for "around $200" (and $180 in the U.S.) represents Google's most ambitious bid for the hearts, minds, and dollars of the developing smartphone market--a potential customer base that numbers in the billions. As expected, the Moto G will come in 8GB and 16GB flavors and will run on Qualcomm Snapdragon 400 chip with a 1.2GHZ quad-core CPU and 1GB of RAM. The phone's 4.5-inch display will come with 720p resolution and 329 ppi. Not cutting edge, but not bad. The phone will ship with Jellybean, but Motorola guarantees of a KitKat upgrade by early January. The G will not be available with the full customization capabilities of the Moto Maker site, but Motorola promises various customization options via interchangeable backs panels, flip shells, and grip shells. None of that is the Moto G's main draw, however. As repeated numerous times during the company's unveiling presentation, Motorola's big selling point of the Moto G will be its approachable (unsubsidized) price point of "around $200." The phone goes on sale starting today in Brazil and parts of Europe. It will become available over the next couple of weeks in Latin America, Canada, and parts of Asia, eventually making its way to 30 countries by 2014. When the Moto G finally does make its way to the US, it will be available via Motorola.com with no SIM-lock and no-contract for $180 for the 8GB version, and $200 for the 16GB version. Motorola said that various carriers may offer their version of the phone for more or less. Verizon has already tweeted that it will be available as a prepaid version in the first quarter of next year without mentioning any specific numberage. The U.S. lag is probably due to three reasons: 1) Motorola does not want to cannibalize sales of the Moto X in the run-up to the Christmas season 2) the unsubsidized price will not turn as many heads in the US where subsidized prices rule the market and 3) but also because the United States is simply not the intended primary demographic. Motorola claims their software-based approach to building the Moto G makes the phone faster and more responsive than the full-sized Samsung Galaxy S4. If the claims prove true--or even somewhat true--the phone's pricetag will prove to be a game exploder. Google's Moto G should set the stage for low-cost smartphones that are faster and more functional, said Roger Kay, president and principal at Endpoint Technologies Associates. "Google, like Microsoft, tries to put out products that go beyond reference designs to prove a point that there ought to be products like this. I'm assuming Google wants Motorola to make money, but not at the expense of the ecosystem," Kay said. The past year has seen all the major manufacturers introduce less brawny versions of their flagship handsets at prices within the grasp of developing populations. Think Apple's iPhone 5c, the Samsung Galaxy S4 mini, or the HTC One mini. There's a reason: The rising middle classes of Latin America and Asia is where all the growth is and where brand/ecosystem loyalty can still be sewn. As long as the Moto G's performance is good enough (especially for users who have not had access to smartphones before), it has the potential to make a lasting imprint in the global market. But perhaps the more interesting part of Motorola's $200 salvo is not how many individual devices it can sell, but the fact that it may create millions of lifelong adherents of the Google/Android ecosystem in the process. IDG News Service reporters Agam Shah and Mikael Ricknäs contributed to this article.